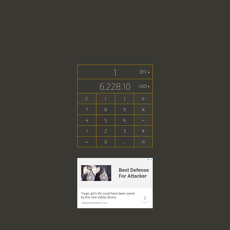 CryptoGround Mining Calculator is a very easy to use calculator which can be used to calculate profitability or number of bitcoins that can be mined via specific bitcoin mining hardware. This website overall is really interesting and unlike most other mining calculator websites, it offers a lot of functionality. Visiting this site will likely teach you something you didn’t know prior about cryptocurrencies somehow or another, regardless of experience level. This site is just simply packed with information and guides that will turn you into a bitcoin guru. 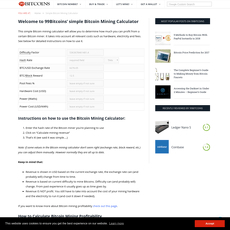 - Easy to use bitcoin mining calculator which includes calculations for hash rate, power, pool fees, difficulty, and price in USD value. - Blockchain news, ICO news, Market news and mining news hubs. 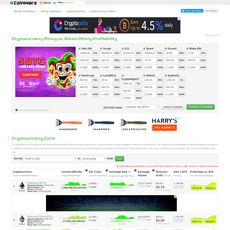 - Trading simulator game what allows you to compete among other crypto traders. - What if calculator allowing late bloomers to see how much money they would have had if they had invested their savings on a specific date in history. 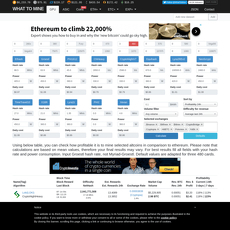 - A crypto compare tool setting many different data points between popular cryptos on a side by side comparison list. This site really packs a lot of fun and informative cryptocurrency functionality. 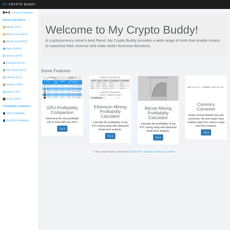 The crypto mining calculator is simple to use. The trading simulation game is a really awesome idea and very fun. This site makes learning about crypto interesting and entertaining. 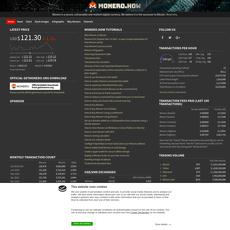 The mining calculator comes with a very comprehensive guide.